West Little River is a census-designated place (CDP) in Miami-Dade County, Florida, United States. The population was 34,699 at the 2010 census. Most of West Little River was originally a neighborhood of the City of Miami when it was annexed into the city of Miami in 1925. With the arrival of the Great Depression, the City of Miami gave up its jurisdiction and West Little River became an unincorporated area of Miami-Dade County. West Little River is located at 25°51′25″N 80°14′13″W﻿ / ﻿25.85694°N 80.23694°W﻿ / 25.85694; -80.23694 (25.856923, -80.237020). West Little River borders the Miami neighborhoods of Pinewood and Miami Shores to the east, Hialeah to the west, and Gladeview and Liberty City to the south. According to the United States Census Bureau, the CDP has a total area of 4.6 square miles (12 km2), of which, 4.6 square miles (12 km2) of it is land and 0.1 square miles (0.26 km2) of it (1.08%) is water. As of the census of 2000, there were 32,498 people, 9,519 households, and 7,386 families residing in the CDP. The population density was 7,093.3 people per square mile (2,739.6/km²). There were 10,298 housing units at an average density of 2,247.7/sq mi (868.1/km²). The racial makeup of the CDP was 32.53% White (3.4% were Non-Hispanic White,) 57.22% African American, 0.26% Native American, 0.18% Asian, 0.07% Pacific Islander, 5.49% from other races, and 4.25% from two or more races. Hispanic or Latino of any race were 40.05% of the population. There were 9,519 households out of which 33.5% had children under the age of 18 living with them, 41.7% were married couples living together, 27.2% had a female householder with no husband present, and 22.4% were non-families. 17.5% of all households were made up of individuals and 6.9% had someone living alone who was 65 years of age or older. The average household size was 3.39 and the average family size was 3.75. In the CDP, the population was spread out with 28.3% under the age of 18, 10.2% from 18 to 24, 27.4% from 25 to 44, 22.6% from 45 to 64, and 11.4% who were 65 years of age or older. The median age was 34 years. For every 100 females, there were 95.8 males. For every 100 females age 18 and over, there were 92.5 males. As of 2000, speakers of English as a first language accounted for 53.61% o residents, Spanish speakers made up 41.21%, and French Creole was the mother tongue of 4.93% of the population. The median income for a household in the CDP was $26,686, and the median income for a family was $29,013. Males had a median income of $22,058 versus $20,524 for females. The per capita income for the CDP was $12,026. About 24.7% of families and 29.0% of the population were below the poverty line, including 38.6% of those under age 18 and 28.8% of those age 65 or over. The Miami-Dade Police Department operates the Northside District Station in West Little River. 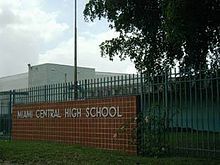 Formerly West Little River Elementary, renamed in 2004 after the chairperson of the MDCPS audit committee. ^ "Demographics of West Little River, FL". MuniNetGuide.com. Retrieved 2007-11-12. ^ "MLA Data Center Results of West Little River, FL". Modern Language Association. Retrieved 2007-11-12. ^ "Ancestry Map of Haitian Communities". Epodunk.com. Retrieved 2007-11-12. ^ "Ancestry Map of Dominican Communities". Epodunk.com. Retrieved 2007-11-12. ^ "Ancestry Map of Honduran Communities". Epodunk.com. Retrieved 2007-11-12. ^ "Ancestry Map of Bahamian Communities". Epodunk.com. Retrieved 2007-11-12. ^ "Ancestry Map of Guatemalan Communities". Epodunk.com. Retrieved 2007-11-12. ^ a b "West Little River CDP, Florida." U.S. Census Bureau. Retrieved on March 12, 2010. ^ "Northside District Station." Miami-Dade Police Department. Retrieved on March 12, 2010. ^ Pinzur, Matthew I. "WHAT'S IN A NAME?" Miami Herald. April 4, 2006. Section Metro & State p. 1B. Available from NewsBank, Record # 0604060114. This page was last edited on 6 September 2018, at 14:18 (UTC).